Evelyn Grzinich (aka eku) is one of the founding members of MoKS and has been the primary driving force behind every aspect of the organization. 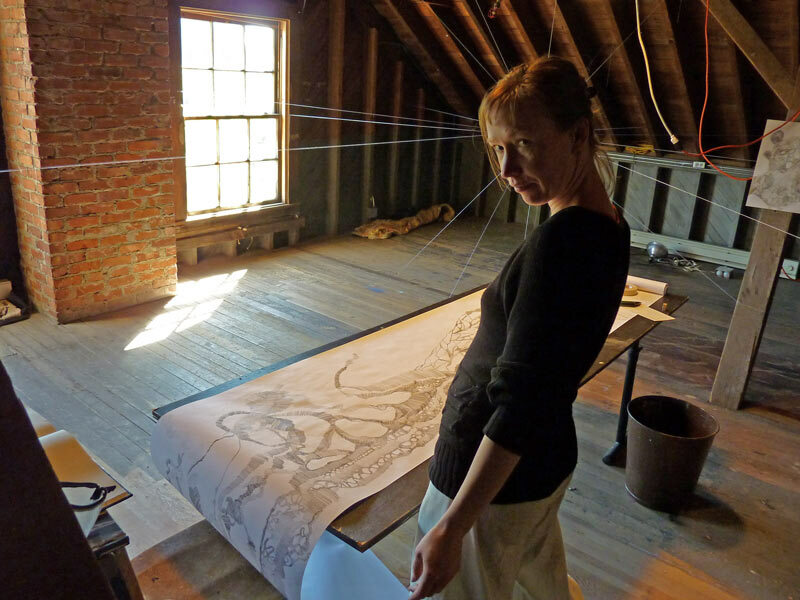 In addition she is a mixed media artist and has been based in Southeast Estonia since 2001 working as an artist-organizer and developing her unique vision of elaborate figurative and abstract works from line drawing and tea stains. This ongoing life-university has offered me opportunity to learn from artists from all over the world and develop fruitful collaborations in various media. My recent interest and ongoing work is with drawing where I explore how the repetitive movement of a pen/pencil affects the body and its motion. This surface-body-surface feedback is a generative method to shift from abstraction to figural imagery. Visual and mixed media artist. MoKS founder and director since 2001.